Welcome to the Per-Ankh Ancient Egypt website, here you will find a wealth of information and featured articles on Ancient Egypt, it's people, culture, Monuments, temples and Tombs, Books and Magazines as well as all the lastest Egyptology News. 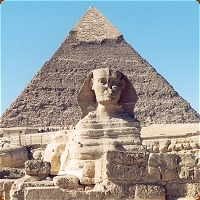 Perhaps the most famous of all the Ancient Egyptian monuments, the Sphinx and the Great Pyramids at Giza have come to represent a lasting testimony to the Ancient Egyptian civilisation. Mortuary Temple of Hatshepsut, daughter of Tuthmosis I and wife of Tuthmosis II, Luxor, Valley of the Kings.